The third and final excerpt in a 3-part series from Kaufman Global’s updated white paper, Implementing Lean Manufacturing: A Holistic Approach. For each of the forms of waste there are certain attack methods. We start with People Energy Waste because it is the most challenging for most organizations. SLIM-IT, noted on the Master Jargon Chart section above (see the full chart in Part #2), is a pronunciation of the acronym for Structure, Lean (Daily Management System), Mentoring, Metrics, Teamwork, Tools, Training and Technology (SLMMTTTT). Kaufman Global’s SLIM-IT model is the primary engine of any Lean (or other) implementation because it aggressively attacks the people energy wastes that derail so many initiatives. Most organizations have ample technology, tools, training and teamwork “potential” to solve almost any problem or achieve any goal. The difficulty lies in compelling the right combination of the “Ts” to come together at the right time. This is what SLIM-IT does. Figure 6 presents the SLIM-IT model. Executive Steering Committee (ESC) that directs and coaches the initiative, ensures alignment and measures engagement. Work Stream Teams that are responsible for an ESC-approved element of work such as implementing shift start-up meetings or transferring a new product into a facility. Experts that provide process coaching, an executive sounding board, content expertise and overall initiative management for the organization. Charters for each Work Stream Team that are developed with and approved by the ESC. Charters include objectives, critical success factors, activities, deliverables, responsibility matrices, schedules and so on. The building block of Lean is the intact workgroup. These are the hands-on associates who work near each other on similar processes every day. Each workgroup of ten or fewer people operates its own LDMS that nurtures improvement and sustains realized gains. LDMS compels, coaches, mandates, and supports workgroup engagement in applying the correct tools to minimize waste in their work area. Primary Visual Display (PVD) – The PVD is a large visual display that presents the current status of the workgroup on key metrics, goals, objectives and action plans. Shift Start-Up (SSU) Meeting – This is a tightly facilitated, structured, daily, stand-up meeting of the intact workgroup held in front of the PVD and lasting no more than ten minutes. 20 Keys ® Action Plan – The 20 Keys approach focuses each workgroup on a long-term improvement plan. Every set of 20 Keys (customized for different functional areas or processes) consists of a chart for mapping goal attainment and a corresponding set of point or level descriptors for individual keys. Each workgroup assesses itself and develops its own 20 Keys Action Plan for improvement. 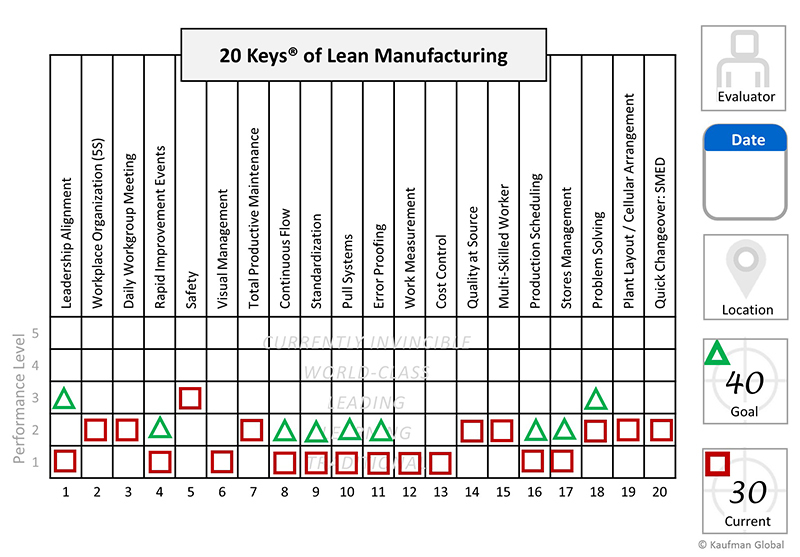 Figure 7 displays a 20 Keys chart for a manufacturing cell that has a current score (denoted with squares) of 30 out of 100 with a goal of 40 within 6 months. The triangles represent the group’s improvement goals for individual keys for the next year. The improvement plan lists the specific actions required by the group’s members to attain the point goals. The chart and the accompanying improvement plan are posted on the group’s PVD. Kaizen Action Sheet (KAS) Improvement System – This technique allows the workgroup to capture small “inspirations” and improvement ideas. These are often “too small” to be considered by the formal suggestion system but are the basis for “kaizen” in Lean. The most important aspect of the KAS system is that it ensures the improvements are relevant for the workgroup. Metrics – This important element integrates detailed micro-process metrics tracking and short-interval coaching to focus individuals and workgroups on the critical few results drivers for a given process. Metrics are selected by the workers with input from management or supervisors / leads. Workgroup metrics are dynamic – if they are not effective in improving outcomes for the workgroup and overall process, they should be revised. Results are reviewed at the start of each work day by the team as part of its daily workgroup meeting. Short-interval coaching (SIC) is a technique where supervisors and managers visit the work area frequently (more than once a day) and provide coaching and feedback related to both results and activities. Short interval coaching is the manifestation of a shift in values for the organization. In the new, more Lean way of thinking and acting, there is greater emphasis on engagement (Is the LDMS fully functioning and improvement? ), workgroup metrics (Is the information on the PVD up to date? ), and improvement (Tell me about some of your Kaizen Action Sheets?). Short Interval Coaching is a vital change management method that must be taught as it isn’t a skill that is naturally occurring in most managers. Everyone in a leadership position can and should participate to reinforce new behaviors. These five elements, if implemented and maintained, provide a rock-solid foundation for any world-class Lean program. They provide the mechanism for each workgroup to take ownership of their work processes. Lean Daily Management System establishes the involvement and commitment that are the soul of world-class achievement in every human group endeavor. All other Lean tools and techniques will realize only a fraction of their potential if any of these elements are not implemented and rigorously practiced. Mentoring is the next element of SLIM-IT. This is the day-to-day coaching of managers and supervisors in real time, on-the-job, as the tools and techniques of Lean are implemented. The coaching must be done by those who understand the why, what and how of applied Lean. Mentoring is the mechanism that assures that management behaviors at all levels will be changed sufficiently and over a long-enough period of time to infuse them into the organization’s culture. Top-Level Strategic metrics that are the traditional measures of overall performance: Cost, Asset Utilization, Quality, etc. Here, less is more. Micro-process: The metrics that workgroups focus on to steadily improve their performance. Here, diversity is key – one size does not fit all. Activity-based metrics: These are the metrics that must be in place to make sure that the organization is engaged and aligned. They measure the occurrence, participation and frequency of the ESC and LDMS along with components contained within – like the effective use of team-based problem solving workshops, Value Stream Mapping as something more than a one-time occurrence and the 20 Keys. Personal performance measures and coaching also play a role here. The linkage between these three types of metrics deserves careful consideration. Usually the top-level metrics get all the attention with little thought to how they are affected by micro-process improvements or measures that ensures broad participation. Tools, teamwork, training and technology approaches are used by every organization in attempts to improve. Many of these approaches work if properly implemented. The key to their success is combining their usage within the other elements of SLIM-IT. Without a foundation of structure and coaching, tools, teamwork, training and technology will fail to deliver what they promise. Workplace Management methods are used to minimize people work wastes. They include standard work, workplace organization and Kaizen. Standard Work techniques are related to traditional Industrial Engineering (IE) analysis. With IE, engineers measure working time to establish concepts like “earned hours.” Standard work involves much more. Using a variety of worksheets (see Figure 5 – Master Jargon Chart), workgroups assess their own work and establish the best way to eliminate all types of waste. Standard work analysis leads to the development of Standard Work Instructions. Notice the sequence of this: The intact workgroup (team) determines the best standard way to do the work, then the Standard Work Instruction is developed. Many organizations get this completely backward and attempt to describe the work from outside the process. This always fails and always requires re-work. The worksheets and templates used to develop standard work are extremely important for two reasons. One, they permit workers in an area to identify and measure micro-process waste that might otherwise be overlooked as insignificant. Two, in the process of attacking waste, workers develop the feelings of ownership that are so critical to the success of the people energy waste techniques. Figure 8 displays the “before” improvement portions of two types of worksheets for an actual cell. The numbers on the Standard Work Instructions (SWI), shown in the left portion of Figure 8, represent worker actions. These actions are measured and classified as manual (hands-on) work, waiting, machine or walking on the Standard Work Combination Sheet (SWCS) shown in the right side of Figure 8. The cell is in trouble because it cannot meet its takt time of 65 seconds. 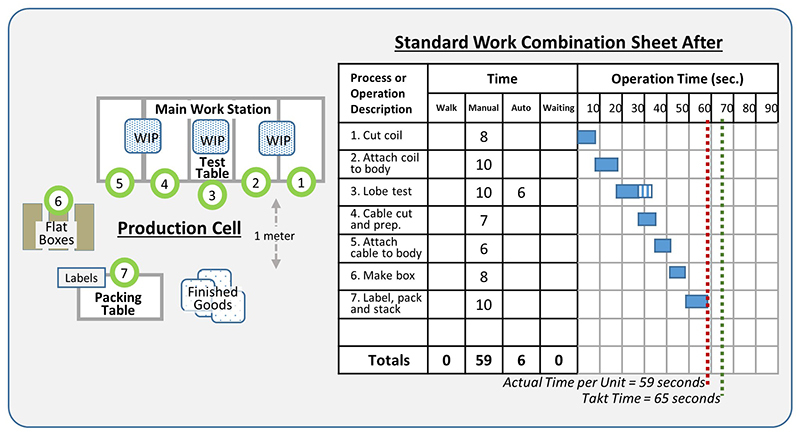 Figure 8 – Portions of a Standard Work Instruction (Left) and Standard Work Combination Sheet (Right) Showing the “Before” Situation in a production cell. Workplace organization, which is intimately involved with standard work, optimizes a workgroup’s environment through labeling, workplace / tool / part arrangement and visual displays. 5S, a Lean technique for cleaning and organizing is usually the starting point for workplace organization. Many organizations start out here because it’s easy for people to understand and natural for them to do. However cleaning and organizing is often the end point for many Lean endeavors. Visual systems – color coding, labeling, floor markings, andon lights, etc., are powerful techniques for making Lean part of the fabric of the enterprise, but they are only part of the system and are not a one-time event. They must be done with the same discipline and follow-up as any of the other methods described here. 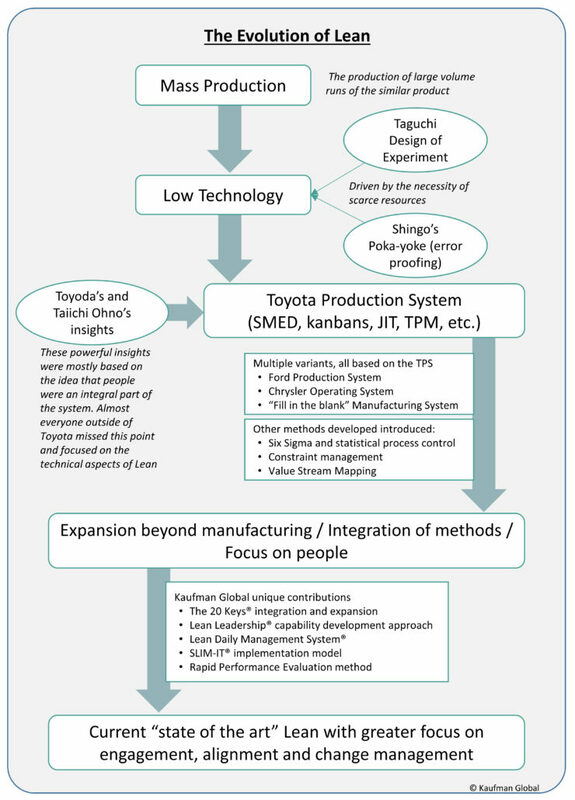 Kaizen, which appears as a separate approach in Figure 5, is actually the interplay of SLIM-IT with all of the other methods and techniques. It’s both the spirit and structure of worker participation in a focused manner. Kaizen Events are structured, team-based problem solving workshops of variable duration. These are only effective when supported and sustained by a functioning Lean Daily Management System. 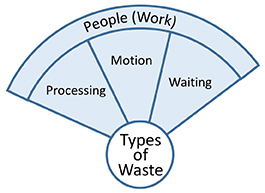 The “after” situation in Figure 9 shows significant improvement toward the elimination of three types of People Work Waste within the cell: walking, waiting and processing. This optimization develops over time. The workgroup is aware of their performance based on their metrics that are a visible part of their PVD board. Sometimes the improvements are incremental and part of the Kaizen Action Sheet System. Sometimes, the improvements are more abrupt and come from Value Stream Mapping or a Rapid Improvement Event. The point is that the standard work of continuous improvement that is embodied by LDMS is a major influence on workgroup, and therefore overall, performance. Just-In-Time (JIT) methods address the quantity wastes of making too much WIP, inventory and movement. Some people refer to all of Figure 5 as JIT or Kaizen. While technically incorrect, the JIT association is frequently made because you cannot employ JIT techniques to remove quantity waste unless you also address the other wastes concurrently. The kaizen substitution derives from much the same logic, although the popularity of kaizen blitzes has made kaizen an all-purpose descriptor for Lean for many people. There are four primary JIT methods: kanbans, leveling, Quick Set-Up (also known as SMED: Single Minute Exchange of Die), and preventive maintenance (PM). We have already addressed kanbans and work leveling to some extent earlier in the paper. Quick Set-Up is a collection of “best practices” that apply standard work and some machine modifications to changeover activities. A typical SMED study involves creating worksheets on a changeover and attacking the root causes of waiting and processing wastes. Reductions of 90 percent or more in changeovers and set-up times are not uncommon with SMED. Machines must be integrated into the level work of a JIT approach. If machine set-ups and changeovers take too long, there will be waiting waste (if downstream parts are not available) or inventory waste (if large lots accumulate to provide work during changeovers). Preventive maintenance is the final JIT method. In a finely tuned Lean system, unplanned downtime is a bigger problem than in a traditional push system that is glutted with inventory. When a machine breaks down in a Lean system, there is little built-up inventory and delivery to the customer is at risk. A well-structured Lean system has well managed safety stocks to protect the customer during such repairs. Lean systems train operators to do routine preventive maintenance tasks such as lubricating and checking so that maintenance technicians can attend to overhauls, teaching operators and making design changes to improve machine efficiency. Error Proofing often referred to by its Japanese name, poka-yoke (pronounced “polka,” as in the dance, “yolk,” as in the egg, and “a,” as in bay), uses a variety of detection, warning, prediction and prevention mechanisms to catch or prevent errors at their sources. As you can imagine, the implementation of workplace management would automatically generate a number of error proofing actions (and vice-versa). Error proofing is a primary technique for quality improvement in Lean because it is so basic and easy for people to apply. One of the primary sources for error proofing ideas is via the Kaizen Action Sheet method contained within the Lean Daily Management System. Six Sigma is a comprehensive set of practices that takes careful aim at variation reduction to improve product and service quality. It contains within it specific methods for statistical analysis, project management and problem solving and emphasizes the DMAIC model: Design, Measure, Analyze, Improve and Control. Kanbans and lot size reductions will always reduce inventory, but they often generate more waiting waste unless standard work is pursued. Error proofing efforts will eliminate only a small portion of those wastes that could be tackled with kaizen and workplace management methods. SMED procedures will dramatically reduce machine downtime in any traditional plant, but the economic benefits pale next to those that also installed kanbans and work leveling. Kaizen blitzes, or rapid improvement events, will deliver big results quickly but without a significant, planned effort to engage the broader organization, the benefits won’t sustain. It is essential to realize that Lean involves both a philosophy and its accompanying approaches and tools. They are mutually supportive and interwoven. If an adequate number of the tools and approaches are aggressively implemented – and enthusiastically coached at the micro-process (hands-on worker or “gemba”) level – the philosophy of Lean springs to life. Simply stated, the full impacts of Lean can only be achieved by implementing a total systems approach. Lean manufacturing is a people process, not a tool installation exercise. It is a journey, not an event. It’s an intensive and proactive effort that requires planning, resources and day-to-day management attention and coaching. It is not easy or painless and must be approached with the understanding that it will take time to change and even longer to create a new Lean culture. Those who endeavor to pursue it holistically will reap the significant performance gains that will allow them to win in increasingly competitive markets, provide significant shareholder value and by enabling an organization of engaged and empowered problem-solvers. If you’d like a pdf copy of the entire white paper (Parts 1-3 in one place), click here to access it via our Resources page. Kaufman Global is a proven implementation partner that focuses on accelerating performance. Since 1995 we have worked with clients around the world to drive enterprise-wide change initiatives and cultural transformations. Leveraging Lean, Six Sigma and proprietary change management techniques, Kaufman Global delivers structured implementation and transformation projects that enable sustainable operational and financial results. 20 Keys®, Lean Daily Management System®, LDMS®, Lean Leadership®, SLIM-IT®, WIN-Lean®, and the Kaufman Global logo are registered trademarks of Kaufman Global. In this installment we discuss why Taiichi Ohno’s original 7 wastes must be updated to include two new ones: Alignment and Engagement – which if not addressed will foil any implementation. Lean is not “installed.” A self-regulating, Lean system is created by a continuous focus on eliminating small instances of waste or “muda” (muda is the Japanese term for “waste”). Waste is defined as any work that does not add value to a product or service. If the customer does not benefit from it, it is muda. All inspections, rework, repairs, walking, material movement, inventory of any sort, waiting, and so on are muda. They all cost money and produce nothing of value for the customer. Lean (pull) slowly evolves from a traditional (push) system as wastes are eliminated little by little. When an organization first begins to initiate Lean activities, it is a traditional system with perhaps a few Lean tactics being applied here and there. At some point, with dedicated effort, it becomes more of a pull system than a push system. 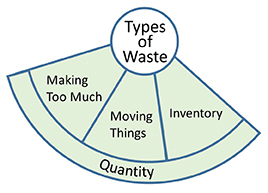 Figure 4 displays the four categories and nine types of Lean waste. 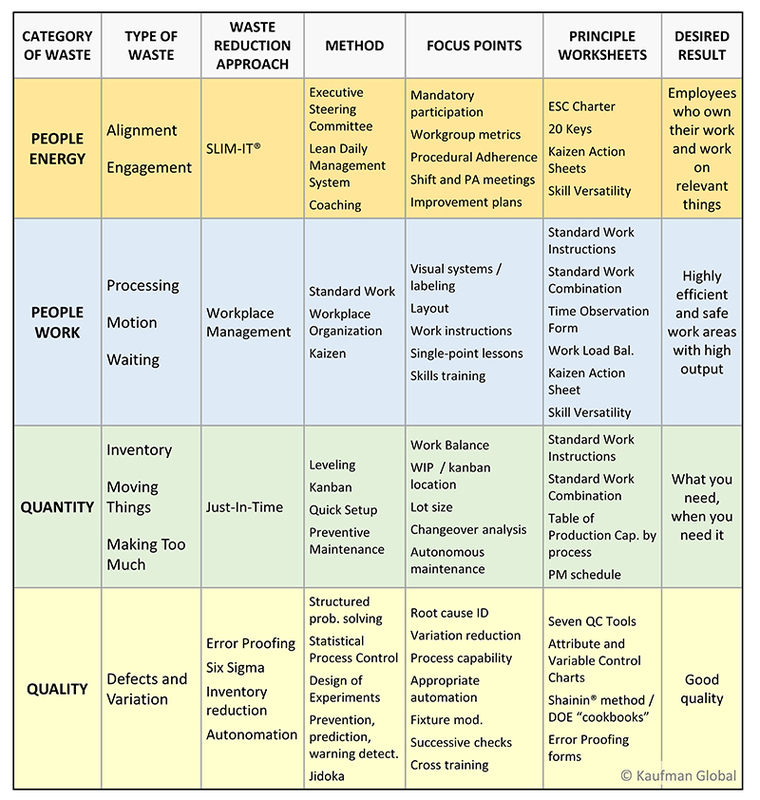 This new model evolved from Taiichi Ohno’s original three categories; People (work), Quality and Quantity, and associated seven types of waste. In the late 90s, an eighth waste that acknowledged the value of people began to appear. That “waste” has been described in a number of ways, including: intellect, creativity, involvement, etc. In the time since it has become increasingly apparent that the people aspect still receives too little attention and prior descriptions have not been specific enough. Kaufman Global gets more direct by describing the People Energy wastes of Engagement and Alignment. 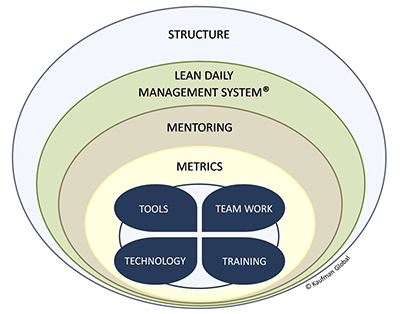 This draws attention to the elements that must be overtly addressed in order to make Lean really work and puts a finer point on the idea of holistic, integrated Lean. It’s necessary to do this because of the almost insurmountable implementation problems that many organizations encounter. Their struggles are driven largely by the fact that people energy wastes are not dealt with as an integral part of Lean adoption. Therefore, we have directly incorporated people energy wastes, along with ways to minimize them, into the basic conceptual model of Lean. The specific definitions of each type of waste are described below. People energy waste arises from a failure to harness the potential that exists in all workgroups. This form of waste is the most important thing to address in Lean implementation or any other type of change initiative. Failure to harness people energy creates most of the significant problems that organizations encounter when they attempt to do something (anything) different. Alignment Waste is the loss of value that arises when management and employees at all levels are not consistently aligned and energized to address critical issues. Making this happen is the sole responsibility of leaders and managers who are easily distracted. Alignment requires conscious and planned strategy and tactics that ensure messaging is consistent, priorities are established, communication is open and deviations are explained. “Flavor of the Day” or “Programs of the Month” are good indications of alignment waste. Good alignment means that you start, and stay, the course. The idea here is to engage and align the organization via well-defined structures. All the good intentions and skills in the workplace cannot operate seamlessly if responsibilities, resources and personnel are not formally assigned and led. Structure requires a formally dedicated steering committee, work stream leaders and teams, explicitly assigned resources, schedules, charters, and champions. Alignment and engagement compel two critical outcomes that are essential change- management requirements for successful implementation: relevance and ownership. Relevance: To sustain any initiative, people must work on issues that are, in some part, relevant to them personally. The most basic and beneficial aspect of good alignment and broad engagement results when individuals and teams are compelled to deliver on improvements and fixes within the processes they control. This creates, by default, an environment where much of the improvement activity is truly relevant to those doing the work. Ownership: Human beings are territorial and proud. If they are associated with something, it is absolutely essential for them to believe that it is admired and respected by others. This tendency is wired genetically into us all. If people are not permitted to exercise some degree of control and power over their work place, they will not be inclined to identify with it nor will they strive to make it excel. This is the underlying basis for the outstanding performance of all self-directed workgroups. Concerning all People Waste, understand that it’s not that the people are being wasteful but rather that these are wastes that are visited upon people by a non-Lean configuration of work. People work waste arises from human actions involving processes. This type of waste is most analogous to the waste encountered in industrial engineering concepts. It can be divided into three categories: processing, motion, and waiting. Processing waste is the result of inefficient work. Typical causes are inadequately trained workers, hard-to-use / locate tools or poor-fitting parts. Employees are hard at work, but there is a better way to do the job. Motion waste is all movement that does not add value. All walking and reaching for parts or tools is muda. Waiting waste is people waiting for parts, help, a machine that is broken or down for a die exchange, and so on. People can add no value to the product or service while they are waiting. There are three types of quantity waste that arise because material (or data or paper) must be processed. This type of waste comes from creating too much inventory between workstations (WIP), Raw and Finished Goods inventory and material movement and transport – think; forklifts, stackers and trucks. Inventory waste arises when inventory is not being used but has been paid for, perhaps has had value added to it, takes up space, requires expensive storage and retrieval systems and becomes lost, damaged and / or obsolete. Finished Goods inventory is even worse, as all of the intended value has been added and several weeks or even months may pass before it is paid for. Work In Process (WIP) waste is inventory somewhere in the system between Raw Materials and Finished Goods. Whenever there is material waiting between two processes, it is waste. WIP waste occurs because process times are not balanced and matched with takt time. Movement waste is all transportation of materials. Shigeo Shingo, the conceptual organizer of Single Minute Exchange of Die (SMED) and poka-yoke (error proofing) concepts, humorously observed that forklift and conveyor salespeople must routinely bribe traditional plant managers. Why? Because, he jested, no other mechanism could explain the incredible amount of unnecessary movement built into the processes of non-Lean plants. Fixing defects is the sole quality waste. Each defect turns value-added work to waste and requires more nonvalue-added work to be repeated during rework or repair. Prior to the implementation of Lean, quality waste is usually the most visible waste due to its impact on customers and the tendency of a traditional push system to fail to recognize the other types of waste as significant. Ironically, reduction of the other wastes through Lean always results in a dramatic decrease in defects. This occurs even without the focused implementation of powerful tools such as error proofing or Six Sigma. The next section presents an integrated discussion of Lean tools, concepts and implementation techniques. The tools and methods should not be separated from the implementation approach. While this paper does not provide a detailed examination of Lean tactics, it does present sufficient information for the reader to determine what they must learn in order to develop a successful Lean implementation initiative in their organization. As muda is eliminated through the application of various Lean tools and methods, a pull system gradually emerges. Figure 5 presents the Master Jargon Chart of Lean Manufacturing. The Master Jargon Chart summarizes and presents the various Lean wastes, tools and methods into a single conceptual framework. Figure 5 is Lean; that is, in order to “do” Lean, the waste reduction approaches and corresponding tools and methods shown there must be comprehensively applied in an integrated manner. All of these tools and approaches need not be implemented simultaneously. In fact, it would be a mistake to do so. Further, the criticality of each tool varies in different environments. This is why a “one-size-fits-all” Lean implementation is a mistake. While all successful Lean organizations use many of the tools to some extent, various tools are more comprehensively applied in certain environments than in others. As we discuss specific tools and approaches, this will become obvious. 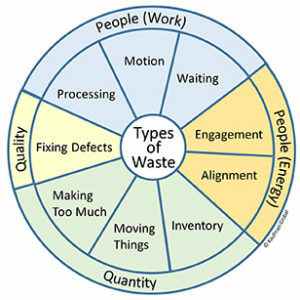 The left two columns of Figure 5 present the four categories and nine types of waste described earlier. The structure of this model might suggest that each waste category is targeted by a specific approach and / or method. While this is true to some extent, all of the methods are extensively interdependent and interactive. You cannot “cherry pick” tools and techniques and expect long-term Lean success. In particular, if you do not employ the methods required to address people energy wastes, the other methods will fail to achieve competitively meaningful results. To be continued. In Part 3 of this series, we provide describe a fail-proof system for implementation. Or, if you’re ready to read the entire white paper now, click here to access it via our Resources page. In this installment: THE EVOLUTION OF LEAN AND WHY PULL IS SO IMPORTANT, we describe the foundations of Lean over the past half-century and why pull vs push is one of the most fundamental aspects of any Lean system. Part 2 discusses why Taiichi Ohno’s original 7 wastes must be updated to include two new ones: Alignment and Engagement – which if not addressed will foil any implementation. Part 3 provides an easy to understand table that shows the systemic nature of Lean: wastes, approaches, methods, tools and results and describes a fail-proof system for implementation. For over 20 years Kaufman Global has pioneered the interface between people and process, always with engagement and alignment at the core. 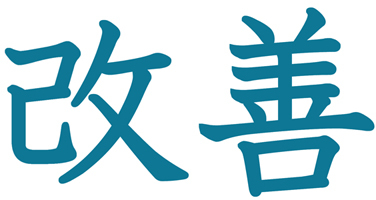 Kaizen is a Japanese word that means “small, ongoing good” (kai) and “good, little, for the better” (zen). The term has come to mean small, continuous improvements by hands-on workers all the time. Lean manufacturing has become synonymous with world-class operational excellence. Under various names (synchronous, pull, demand flow, flexible, cellular, just-in-time, one-by-one), Lean is the single most powerful strategy for improving a production operation’s competitiveness. The dominant players in every market segment are aggressively implementing Lean as a strategic weapon because they realize they have no choice. If they don’t “do Lean” and stay Lean, they will quickly fall behind the market leaders because they are less able to adapt to an ever-changing competitive environment. This white paper is directed at organizations that are either eager Lean practitioners or those who have not yet had a Lean awakening. Both will find value in its explanation of the foundations and basic mechanics. 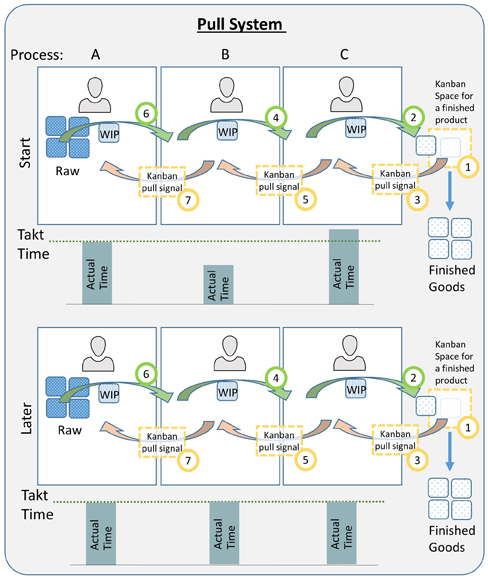 Additionally, this paper describes Kaufman Global’s specific approach to Lean implementation and our learnings over years of working with clients. Our method is holistic and pragmatic, reduces implementation time, increases benefits and ensures sustainability. Kaufman Global has pioneered several techniques that are in wide use across a broad spectrum of industries and business today, including: the SLIM-IT® model for implementation, Lean Leadership®, the 20 Keys® and the Lean Daily Management System® (LDMS®). Lean manufacturing, or Lean, is an integrated leadership philosophy, management system and set of tactical methods / tools that focuses on creating an operation with minimal amounts of nonvalue-added activity, inventory (Raw, Finished and Work-In-Process) and errors. The primary engine for eliminating nonvalue-added elements in Lean system is the employees who do the hands-on work. While the mechanics and approaches of Lean may not be clear to everyone, there is little doubt concerning the magnitude of potential benefits. Years ago, in order to get people interested in the notion of Lean, it was necessary to quote double digit percentage savings from process improvement. Without making that list here, in our experience any process is capable of a 10 – 30% improvement if Lean is applied with some rigor. This is in any and all dimensions whether it be cycle time, lead time, quality, inventory, customer satisfaction, absenteeism, etc. Results like this cannot be attained by chance or half-hearted, informal initiatives. They can only be generated through carefully planned and aggressively supported efforts that are overtly led by management. Isolated improvements have no chance of leading to an organization-wide transformation of day-to-day behaviors, expectations, metrics and the entire system of work. Figure 1 is a conceptual diagram showing the progression of Lean between the 1940s and today. Lean would not have emerged as a structured system when it did (or at all, perhaps) if it had not been for two circumstances. The first was the condition of Japan after World War II. Totally devastated and with few resources, Japan could not compete with other industrialized economies on costs, volume or quality using standard mass production approaches. There wasn’t enough money to build modern factories or buy modern equipment. Japanese manufacturers had to “make do” with what they had; and they had very little. This massive handicap created the ideal conditions for the true catalyst of Lean to operate. This second circumstance was the pioneering thinking of Kiichiro Toyoda, Taiichi Ohno, and Shigeo Shingo. Their focus on low-tech, pull systems and the elimination of waste evolved into the Toyota Production System (TPS) over the period from 1945 to about 1975 (the original, Toyoda, was changed to Toyota for American consumers). The 1990 book, The Machine That Changed the World by James Womack, et al, popularized the term Lean manufacturing to refer to the TPS and its derivatives. Other generic names for the TPS are flexible, cellular, one-by-one, pull, synchronous, demand-flow and World-Class manufacturing. Also used are just-in-time and kaizen although both are only elements of the TPS, not the entire system. Starting in the mid-1980s, the large automobile manufacturers adopted many of the basic principles of the TPS, but each changed the name to something that sounded more “home grown” to their employees, customers and shareholders. Other companies have since taken the same approach. Thus, it is common to find that Company X has the “X Production System” in place. Peel back these “labels,” and you find significant elements of the TPS underneath. During the 1990s, it became apparent that there was plenty of room for Lean application far flung from automotive assembly and well beyond the factory floor. This started the integration of methods and techniques that is still going on today – Office Kaizen is one example. As organizations from all industries, sectors and segments embraced adaptations of the TPS, new tools and methods were developed and Lean continued to evolve. In the mid-2000s, the term operational excellence or “OpEx” started becoming the popular catch-all phrase for operational improvement of any kind. It allows for the inclusion of a multitude of techniques – especially the integration of Lean and Six Sigma – and is often more acceptable to the ears of those in non-manufacturing pursuits. The generality of the term is also its weakness because anyone doing anything to improve performance can proclaim they have OpEx – which may or may not be true. While the basics never change, the Lean of today has many additional bells and whistles that Toyoda, Ohno and Shingo did not develop but would have welcomed. Anything that enhances the fervent elimination of waste is part of Lean. A critical distinction between Lean and traditional systems is the pull philosophy of Lean versus traditional manufacturing’s push philosophy. Figure 2 displays the mechanics of a typical push system with three employees working on three consecutive processes. The curved arrows represent sequential actions of each process step. In this example, each of the three workers does his / her work at the same time independently and then passes the completed item to the next worker. We assume that each worker performs each and every task at a constant rate of speed. The “start” scenario illustrates the situation in the cell as it has just started to work on a new product. The Process A worker has four pieces of Raw inventory waiting to be worked. There are also four pieces of Work-In-Process, or WIP, waiting for both the Process B and Process C workers. Each worker has one piece of work at their station. There are four pieces of Finished Goods waiting to be picked up after Process C. In Figure 2, the processes are not balanced. We know this because the workers, operating at a constant rate of speed, require different amounts of time to do their work. Takt Time (TT) is noted for each process. Because at least one of the workers is over the Takt Time (TT), it will be impossible for the three-person workgroup to meet customer delivery demands unless additional resources in the form of time or people are added. Takt is the German word for “cadence” or “rhythm” (pronounced “t-ah-k-t” in German but typically pronounced “tack” in English). In the TPS, Takt Time is the heartbeat; it is the standard time interval between the each output of a product from a process that is required to meet production demand. TT is obtained by dividing the total amount of work time in a day or shift by the required output. That is: Takt Time = total time in seconds / required output. The bar graph below each process represents the amount of actual time that each worker requires to perform their work to the product. The rate of completion of work for each process varies because the work is unbalanced: Process C takes the longest, B is the fastest. Process A tasks are the only ones that match the Takt Time exactly. After some period of time operating under the typical push philosophy, the original “start” situation has evolved into the “later” example shown in the bottom half of Figure 2. With a starting level of four pieces of inventory between each worker, Worker B frequently ran out of material because they are out of balance with the preceding process (A). The supervisor or manager, uncomfortable at seeing an idle worker and believing that any work is better than none, ordered that more inventory be added so that Worker B could stay busy. This typically happens as managers strive to make “earned hours” or “standard labor hours” look better. If the workers in Processes A, B and C are operating machines, the quest for better “absorption” numbers creates additional pressure to build up inventory. Raw material accumulates with Worker A because it is pushed to the operation by Materials Management and Production Control. More and more inventory is added until all workers are kept busy all the time. The result is masses of inventory of all types – Raw Materials, WIP and Finished Goods. Upon seeing busy workers and a lot of inventory, managers receive the false perception that considerable value is being added and that there is a lot of product almost ready to meet customer demand. Worst of all, because everyone appears busy, the issue of unbalanced work between the three workers and the inability of the cell to meet takt time is seldom addressed. This is the root cause of the entire inventory buildup. Rather than focusing effort on balancing the work in the cell, the push reaction is to resort to overtime, more workers, more expensive equipment, or all three. Note the diagonally striped squares that appear in the “later” scenario of Figure 2. These are “problem” assemblies: a part was bad, an assembly error was made and / or a component was missing. When one of these problems occurs, the unit is pushed off to the side for later assessment. However, in most push systems, these problems are rarely addressed — and, when addressed, never timely. With the organizational imperative to stay busy and make more, the problem units appear insignificant among so much other inventory. Figure 3 presents analogous “start” and “later” scenarios for a pull system. A detailed examination of demonstrates the power of a pull system to overcome the problems created by the push approach. In the “start” configuration, the times for each process to complete one unit are identical to those in Figure 2, as is the TT. The first thing noticeably different about Figure 3 is that there is little inventory. This is not something that happens all at once when transitioning from the Figure 2 push system, but is a gradual result of moving towards a pull system. The second major difference is that the three processes do not work independently. Work is always “pulled” from upstream. The pull begins when the completed unit at station one (1) is removed. 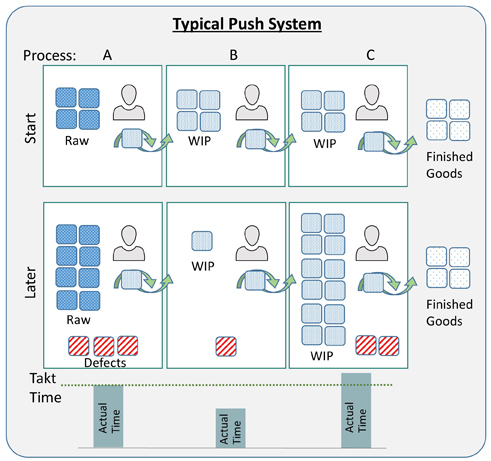 This creates an empty spot, which generates a need that pulls the completed unit from Worker C. This pull message is called a kanban (denoted by dotted box in Figure 3). Kanban in Japanese, originally meant “store sign.” It is said that Kiichiro Toyoda got the idea for the pull system from a visit to a US supermarket after World War II (goods pulled off the shelf today are replaced tomorrow). In reference to what he had seen, he called a pull signal a kanban (rhymes with “bon-bon”). A kanban can be a spot on the floor, a pallet or a piece of paper attached to the material or the material’s container. Traditionally, it was a card or sheet placed in a see-through pouch. The kanban states what it can accept. For example, if a pallet is the kanban and a pallet can hold 16 assemblies, Worker C could continue to place work on the kanban until it has reached its limit of 16. At that point, no more units could be added to the kanban. Worker C would have to stop working after completing the unit in front of him and wait until the kanban was emptied. In our example, the kanban only holds one piece. If the downstream kanban is full and Worker C has completed work on the at their station, they must stop working and wait. Nothing can move without a kanban, only Production Control can create new ones. The beauty of the pull system is that if there is a problem at a downstream process, the entire line stops. No worker is permitted to work on another unit and / or build up inventory unless a kanban arrives. The “later” scenario in Figure 3 shows that the three processes are more balanced than at the “start” scenario. 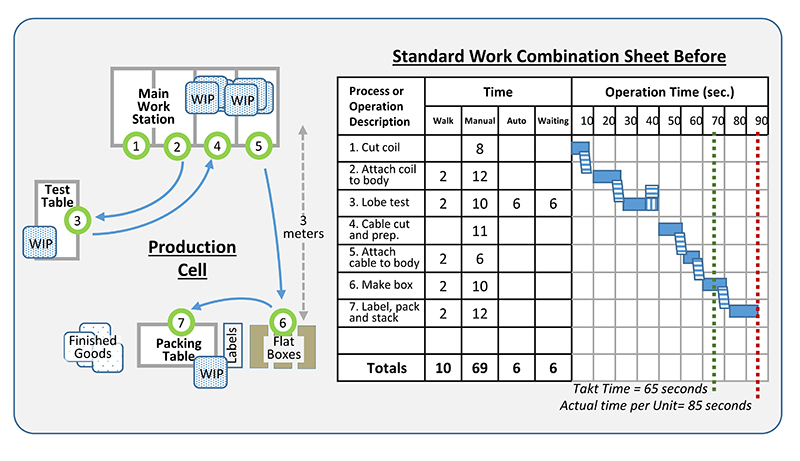 In a pull system, there is a continuous effort to balance work between adjacent processes workers and cells to eliminate waiting and reduce WIP inventory. Also note that there are no problem units in the later scenario. Since inventory is not pushed along the production sequence, each problem unit in the pull scenario creates an “empty spot” in the process chain that cannot be hidden by WIP inventory. Management and employees are energized to address problems by the very nature of the pull system. As a result, errors decrease and quality improves. To be continued. 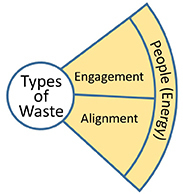 In Parts 2 and 3 of this series, we update Ohno’s original waste wheel with the most dangerous waste of all: people energy and provide an easy to understand table that shows the systemic nature of Lean: wastes, approaches, methods, tools and results. Then we describe a foolproof template for implementation. If you’re ready to read the entire white paper now, click here to access it via our Resources page.